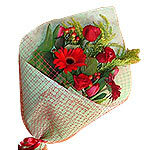 Product description: This Beautiful bouquet will add a touch of elegance to any room. 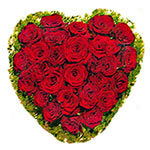 Its composed of flowers in red combination with tulips, roses and daisies with greens. 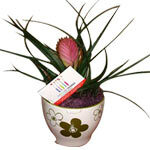 This lovely indoor green Tillandsia plant says Welcome in a big way and you will get a big thank you when you send it. 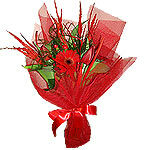 With its artful design this bouquet will make any celebration even finer. 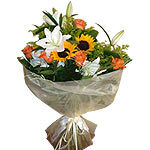 This Glorious Beauty is composed of Lilies, sunflowers, roses and more. Send some loving memories to your loved one with this red coloured bouquet, consisting of roses, tulips gerbera and seasonal greens. 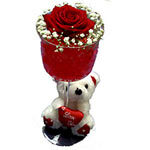 Nice way to express your love. 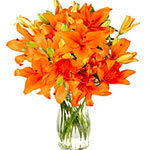 Congratulate someone special by sending these stems of orange lilies and appreciate their success. These flowers surely make them happy.